[SAR018918] Scottish Housing, Newtongrange Estate Newbattle, Midlothian, Scotland. 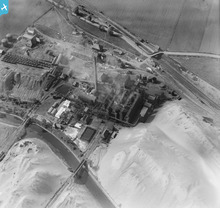 An oblique aerial photograph taken facing North. [SPW042200] Lothian Coal Co. Whitehill Colliery, Carnethie Street, Rosewell. An oblique aerial photograph taken facing south. 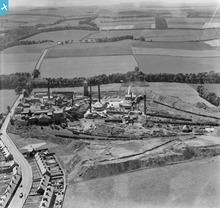 [SPW020272] William Baird and Co. Dumbreck Colliery, Queenzieburn, Kilsyth. An oblique aerial photograph taken facing north. I believe this is the same Wm Baird company that owned and operated the Craighead pit in Blantyre, Lanarkshire. That is correct. Bairds were a pig iron and steel manufacturing company based at Gartsherrie, owning their own pits across Lanarkshire and Ayrshire and also into the North of England. They also owned the coke works here at Dumbreck which is the subject of the photo. 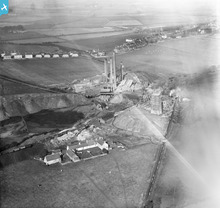 In 1931 the Ayrshire pits merged with those of the Dalmellington Iron Co. to form Bairds and Dalmellington, 75% controlled by Bairds and with a 70% control of the Ayrshire coal field. They were later (1939) part of Bairds & Scottish Steel Limited when they merged with the Scottish Iron & Steel Co.
[SAW018867] Telegraph Condenser Co. Ltd. Whiteside Works, Bathgate. 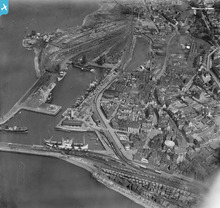 An oblique aerial photograph taken facing north. 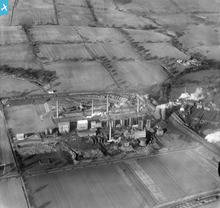 [SAW039286] Kirk o'Shotts Transmitting Station, under construction, and Dewshill Colliery. An oblique aerial photograph taken facing north. This image has been produced from a print. [SPW020309] Valleyfield Colliery, Low Valleyfield, Culross. An oblique aerial photograph taken facing north. [SPW017714] Oil Works, Broxburn. An oblique aerial photograph taken facing north. [SPW027154] James Ross and Co. Philpstoun Oil Works, Philpstoun. An oblique aerial photograph taken facing north. 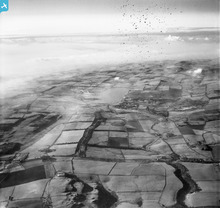 [SAW041295] Loch Fitty and St Ninians Opencast Coal Mine, Kelty. An oblique aerial photograph taken facing west. This image has been produced from a damaged negative. 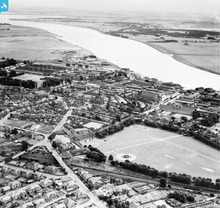 [SAW024460] Alloa, general view, showing St Mungo's Parish Church, Bedford Place and West End Park. 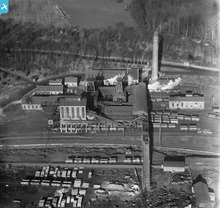 An oblique aerial photograph taken facing south. 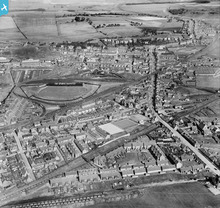 What was the pit behind the football ground called? And who owned it? 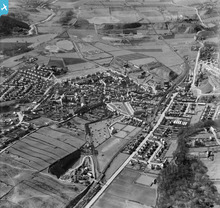 [SPW056746] Kilsyth, general view, showing Burngreen Park and Stirling Road. 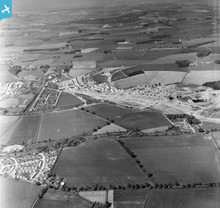 An oblique aerial photograph taken facing south-west. 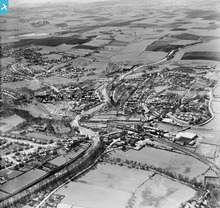 [SPW056743] Kirkintilloch, general view, showing Forth and Clyde Canal and Kilsyth Road. An oblique aerial photograph taken facing south. [SPW042199] Lothian Coal Co. Whitehill Colliery, Carnethie Street, Rosewell. 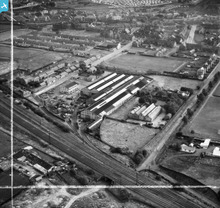 An oblique aerial photograph taken facing south-east. Whitehill Colliery, Carnethie Street, Rosewell, Lothian. 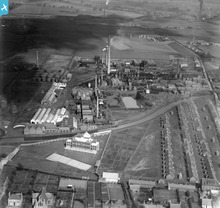 [SAW032454] Denny, general view, showing Cruikshank and Co. Ltd. Denny Iron Works, Glasgow Road and Herbertshire Colliery. 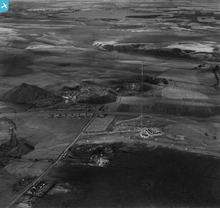 An oblique aerial photograph taken facing east. 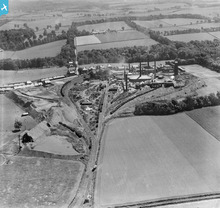 [SPW019535] Montgomeryfield Colliery, Broomfield, Irvine. An oblique aerial photograph taken facing north. 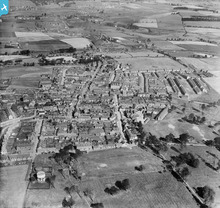 [SPW040414] Lochgelly, general view, showing High Street and Bank Street. 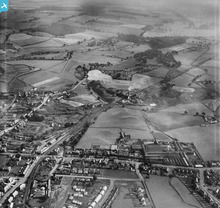 An oblique aerial photograph taken facing north. 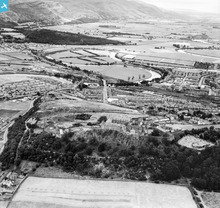 [SAW024465] Stirling, general view, showing Stirling Castle and Union Street. 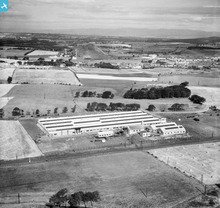 An oblique aerial photograph taken facing east.